Happy Saturday! 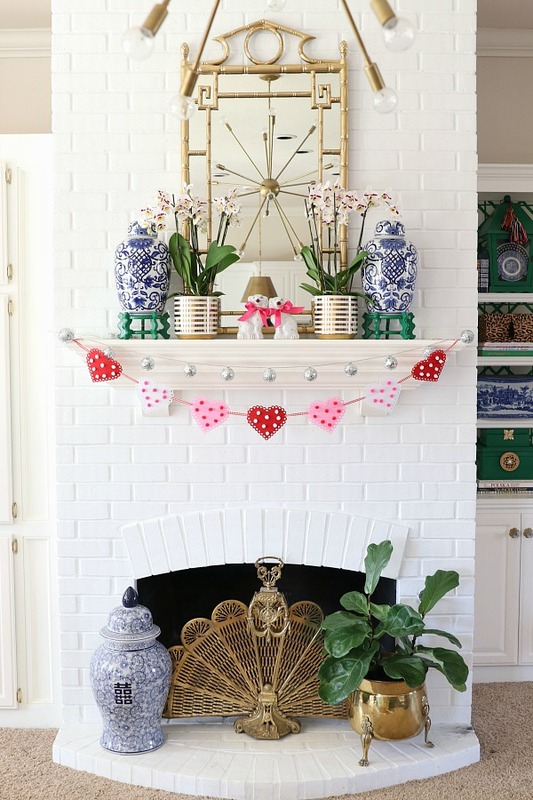 I never post projects on Saturdays, but I just decorated for Valentine's Day yesterday and didn't want to wait any longer to share in case you're doing a bit of decorating this weekend too! 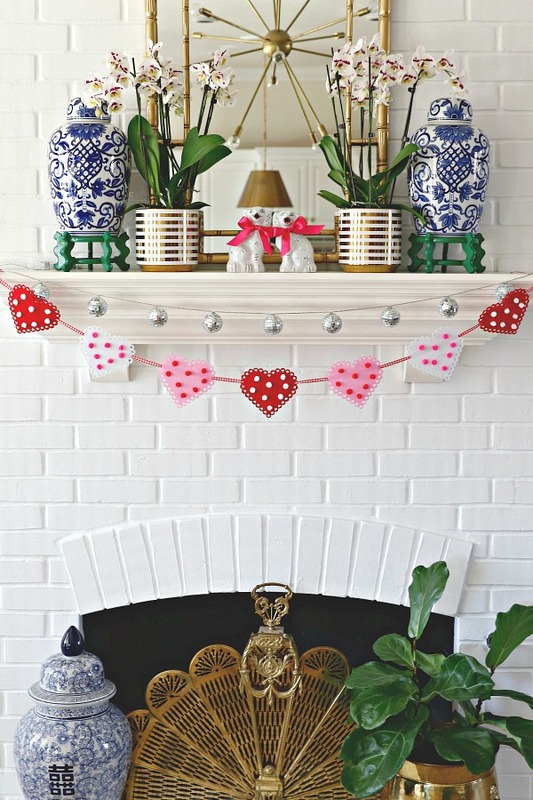 I typically don't put up a lot of decorations for Valentine's day, I just add a few touches to key areas- the mantel and the front porch- to make the house feel festive. I picked up a few things from Dollar Tree and had some things from Hobby Lobby on hand, and in less than an hour yesterday I had a few new pieces made and up! Dollar Tree sells the cutest packs of felt hearts, I love the cut out scalloped edge. They're super easy to thread a ribbon through and you've got a quick garland (I just put a pushpin in each corner of the mantel to attach the garland to). I was watching my friend Charlotte's Instastories a few days ago and her son was putting pom poms on his valentines. Brilliant! I followed suit and decorated mine with these. 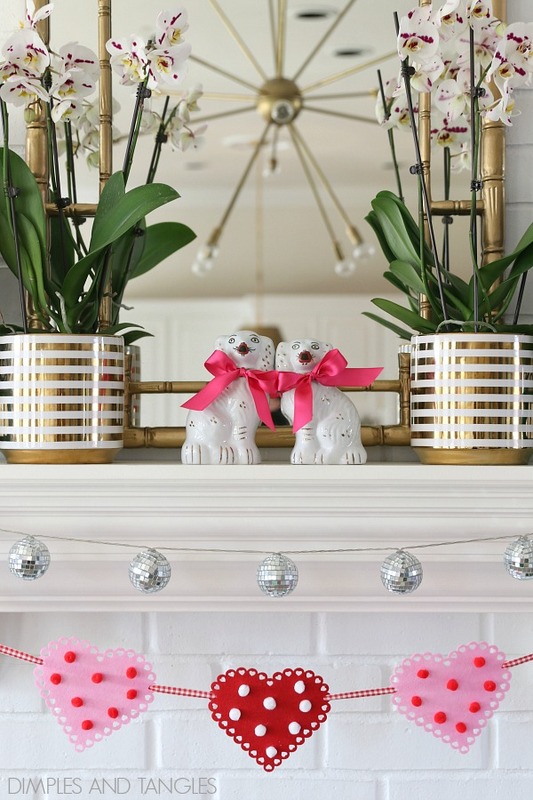 I added a lighted mirror ball garland with it and a couple of new orchids from Walmart. It all reminds me that Spring isn't too far away! Let's move out to the front porch! After Christmas I removed all of the ornaments from my flocked wreath and trees and kept them out for a "winter" look. 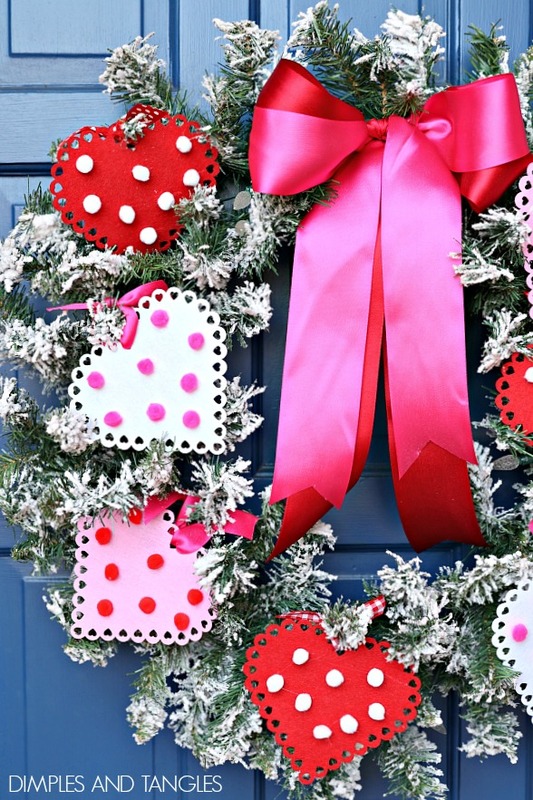 For Valentine's Day I just tied on more of the felt hearts with pieces of ribbon and added a big, simple bow. 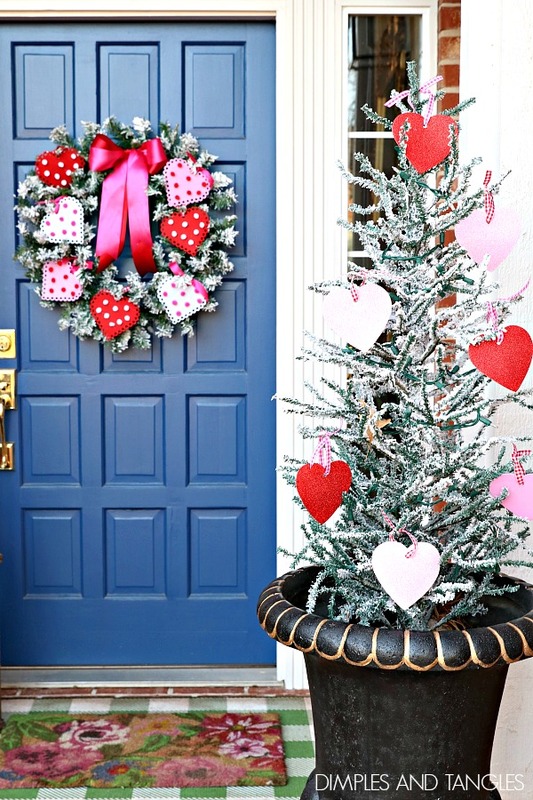 I also bought a package of glitter foam hearts at Dollar Tree, punched a hole in the top of each one, and tied them on to the flocked trees with ribbon. So that's it! With a few simple additions we're ready to celebrate the holiday this coming week. I will be sharing a Valentine Tablescape with you on Monday, see you then! Those poodle dogs are so ugly they are cute. Love how you decorated. 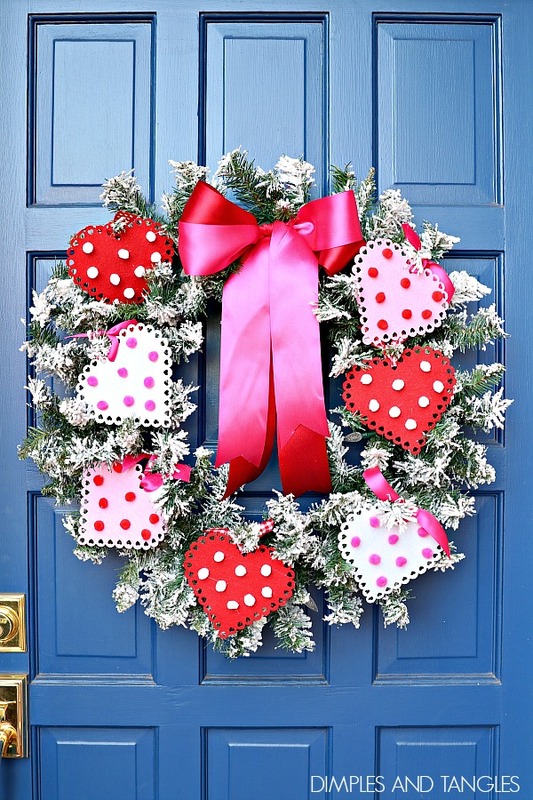 We are away in FL for the month but next year , before we leave I am so doing this to my porch!!! Thanks so much for the inspiration!!!! I think I’d rather be in Florida! Ha! 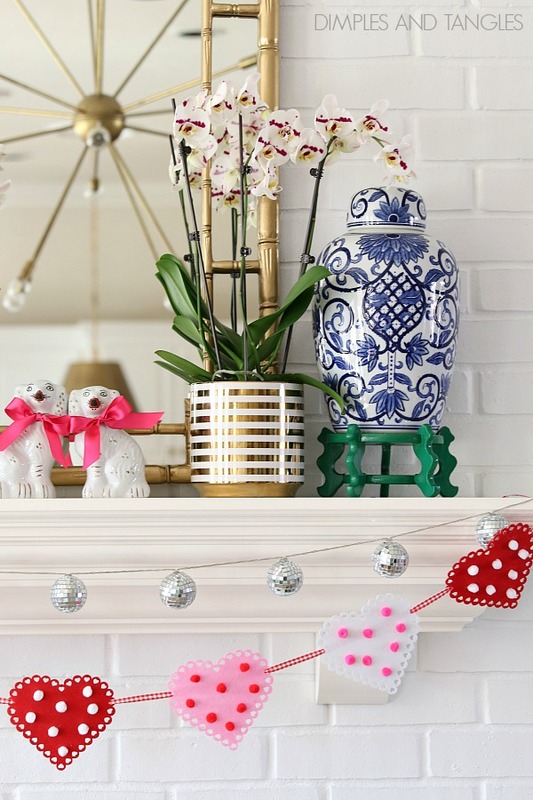 So pretty and festive - I love the dogs and the pom poms! Have a Happy Valentine's Day! I forgot to ask you; did the orchids come with the bamboo trellis's?? Are the orchids real? Please email me at szpinky@aol.com Thanks!! Headed to Dollar Tree now - it's not too late, right?! I just bought mine a few days ago, hopefully they still have some! I just absolutely love that blue door! 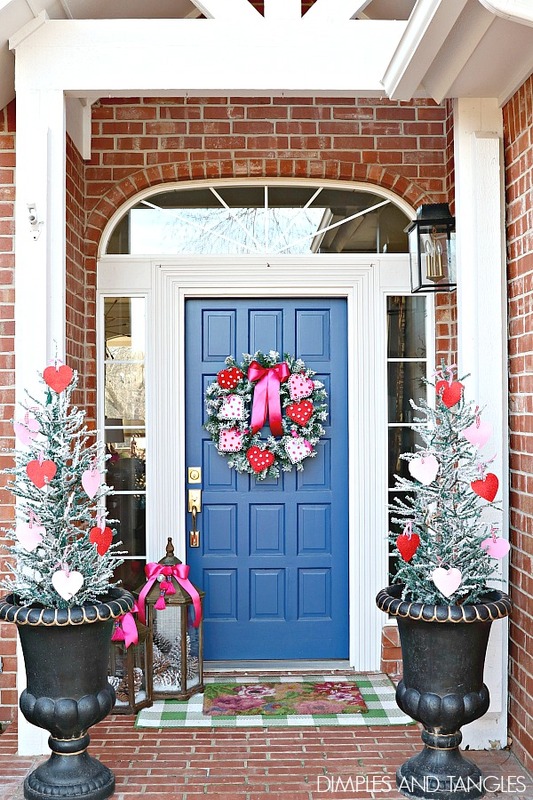 Love love LOVE it, especially your front porch! GREAT job!